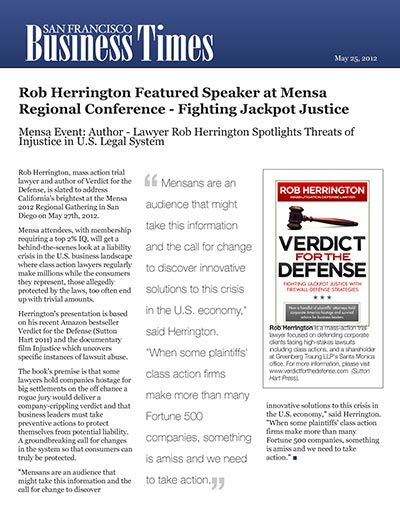 Rob Herrington, mass action trial lawyer and author of Verdict for the Defense, is slated to address California's brightest at the Mensa 2012 Regional Gathering in San Diego on May 27th, 2012. Mensa attendees, with membership requiring a top 2% IQ, will get a behind-the-scenes look at a liability crisis in the U.S. business landscape where class action lawyers regularly make millions while the consumers they represent, those allegedly protected by the laws, too often end up with trivial amounts. Herrington's presentation is based on his recent Amazon bestseller Verdict for the Defense (Sutton Hart 2011) and the documentary film Injustice which uncovers specific instances of lawsuit abuse. The book's premise is that some lawyers hold companies hostage for big settlements on the off chance a rogue jury would deliver a company-crippling verdict and that business leaders must take preventive actions to protect themselves from potential liability. A groundbreaking call for changes in the system so that consumers can truly be protected. "Mensans are an audience that might take this information and the call for change to discover innovative solutions to this crisis in the U.S. economy," said Herrington. "When some plaintiffs' class action firms make more than many Fortune 500 companies, something is amiss and we need to take action."